King Roger II of Sicily - See Palermo and Western Sicily. Roger II, a member of the Norman de Hauteville dynasty which arrived in Italy as knights early in the eleventh century, was the first medieval king of Sicily, and it was during his reign that a true Sicilian nation, inhabited by a "Sicilian people," can be said to have been established. It was also during this period that Sicily finally became identified as a region of Europe, rather than Africa (as under the Saracen Arabs) or even Asia (as under the Byzantine Greeks). Roger II was a son of Roger I, Great Count of Sicily, and Adelaide of Savona. Count Roger was a younger brother of Robert "Guiscard" ("the crafty") de Hauteville, overlord of Sicily and much of the Italian peninsula south of Rome, with Salerno as its largest city. Born 22 December 1095, young Roger was educated by erudite Greek and Arab tutors, with the occasional Italian or Anglo-Norman visitor, and at court Italian and Norman French were spoken in addition to Greek and Arabic. He boasted a natural ability in languages, arts and, to some extent, sciences. He was naturally curious, and comfortable among the common people, whose languages and dialects he spoke. He spent some of his early years at San Marco d'Alunzio, in the Nebrodi Mountains, and was knighted in 1112 in what is now known as the Norman Palace of Palermo. His knighting brought Roger into public life. Whereas his father and uncle were conquering warrior knights, Roger II, who succeeded his elder brother, Simon (1093-1105), in 1105 and effectively ruled Sicily from 1112, spent much of his time in administration at Palermo, with the occasional foray into peninsular Italy to convince unruly Norman vassals of his feudal authority. In 1127, he succeeded a cousin, William (grandson of Robert Guiscard) as Duke of Apulia, and soon was recognised by Pope Honorius II as ruler of other southern dominions. The papal succession to Honorius was disputed, with one rival pontiff, Anacletus II, recognising Roger's rights while another, Innocent II, did not. The Capuan and Neapolitan dominions were also contested, particularly by certain Longobard and Norman lords. Nevertheless, Roger was crowned King of Sicily in Palermo Cathedral in 1130, with Anacletus' blessing, and by late 1139, following the deaths of Anacletus (in 1138) and the last feudal rebels, his uncontested authority was recognised by Innocent II. Fearing Roger's growing political power, the Holy Roman and Byzantine emperors joined forces, meeting in Constantinople to discuss ways to thwart his geopolitical influence. In 1118, Roger wed Elvira (died 1135), daughter of Alfonso VI of Castile. In 1149 he wed his second wife, Sibyl of Burgundy (died 1151). In 1153 he married his third and last wife, the much younger Beatrice of Rethel. 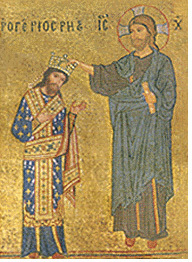 A contemporary mosaic icon in Palermo's Martorana church (shown here) depicts a brown-haired, brown-eyed Roger being crowned directly by Christ, thus reflecting the belief that, apart from being the Pope's "Apostolic Legate" in Sicily, his royal authority emanated directly from God. The gold fleurs-de-lis on a blue field represent one of the earliest known uses of what was to become an enduring heraldic symbol of the French kings, while the crown is distinctly Byzantine in style. East meets West. During Roger's reign, Palermo (the Arabs' splendid city of Bal'harm) emerged as one of the wealthiest royal capitals of Europe and the Mediterranean. The revenue from Palermo alone exceeded that from the Normans' entire Kingdom of England. There were actually close connections between the Sicilian (or southern Italian) and English kingdoms, though Roger's authority was more akin to that of a Byzantine emperor or Arab emir than that of any northern European monarch. As the King of Sicily spoke Arabic, kept a harem, and frequently found himself at odds with the Roman Church, Roger (and later his grandson Frederick II) was sometimes called "a baptized sultan." The fact that both sovereigns refused to conduct open Crusades against the Muslims (Frederick's "crusade" bore the mark of more diplomacy than bloodshed) only engendered greater suspicion in papal circles. With his grandson Frederick II, also an independent-minded intellectual, Roger II was considered one of the most enlightened rulers of his age. The Assizes of Ariano, a legal code established in 1140, set forth a system of feudal law within a centralized form of government. The Kingdom of Sicily under Roger II was characterised by its multi-ethnic nature and religious tolerance. Byzantine Greeks, native Jews, Muslim Arabs, Normans, Longobards and "native" Sicilian peoples lived in harmony. Feudalism was introduced in a form slightly different from that of Norman England, with more emphasis on royal authority, and slavery virtually abolished. Freedom of worship was preserved, with mosques, synagogues, Byzantine (Orthodox) churches and Latin (Roman Catholic) cathedrals existing side-by-side. Personal rights were respected, and the legal code permitted the accused to be tried according to the laws of their own ethnic culture. The "Norman-Arab" style of art and architecture flourished. It was Sicily's Golden Age. Sadly, none of this was to last for long. Already by the reign of Frederick II (in the first half of the thirteenth century), the Church in Sicily was thoroughly Westernised (with fewer Orthodox communities), while Islam's influence was rapidly diminishing. Roger I had accepted the duty of Apostolic Legate, effectively "protector" of the Roman Church in Sicily, in 1098, allowing the sovereign a voice in ecclesiastical affairs and preceding by decades similar claims by Henry II of England in his Constitutions of Clarendon (1164). The Sicilian sovereign's hereditary Apostolic Legateship was exercised throughout the reign of Frederick II, finally being formally abolished only many centuries later. Always a curious intellectual, Roger supported numerous scholarly projects, including al Idrisi's Book of Roger, one of the greatest geographical achievements of the Middle Ages. Foreign men of letters were always welcome at court. Like Sicily's multicultural society, Roger's administration was unique for its time. 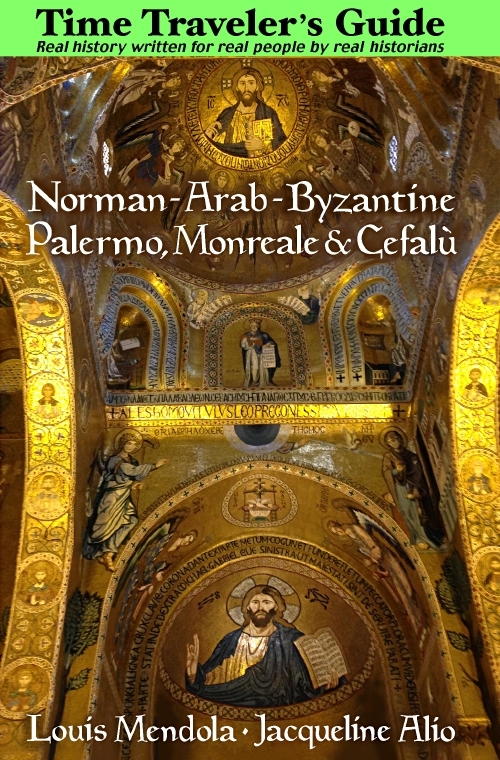 Norman administration co-existed with older Arab institutions, and official documents were published in Greek, Latin, Arabic and, occasionally, Hebrew and Norman French. Inroads into Byzantine territories in the Balkans and Arab territories in northern Africa, augmented by the capture of Malta and Corfu, extended the kingdom further. In Italy, the Norman realm soon became known simply as the "Regnum," the Kingdom. King Roger died on 26 February 1154, shortly before the birth of his last child, Constance (mother of Frederick II), who lived until 1198, and is entombed in Palermo Cathedral. He fathered numerous children, legitimate and otherwise, and was succeeded by his son, William I, crowned as co-monarch in 1150. This was a common Norman practice, followed by Henry II of England twenty years later, to ensure uncontested succession. For about a century following Roger's death, Palermo remained in every sense the royal capital of southern Italy, and Sicily was a true kingdom where a resident monarch ruled over a multicultural society. The Palatine Chapel, Martorana Church and other Palermitan monuments stand as testaments to the creative reign of Roger II. Today, the Norman Hautevilles and their successors, the Swabian Hohenstaufen (and especially Frederick II), remain cherished symbols of a glorious era.